The Saginaw Gears were in their eighth year of existence in 1979-80. The Gears were a secondary affiliate of both the Toronto Maple Leafs and Los Angeles Kings. Don Perry was Coach/GM and Wren Blair was owner. After going .500 in 1978-79, the Gears improved to 43-27-10 in '79-80, second place in the North Division. They were just one point ahead of third place Port Huron and three back of league champ Kalamazoo. Saginaw featured the third-best offense in the IHL that year, scoring 349 goals. Rookie sniper Scott Gruhl led the Gears with 53 goals and 93 points--not bad for a rookie season! Warren Holmes, Marcel Comeau and Claude LaRochelle each scored over 30 goals that year, and five other Gears scored at least 20. Saginaw finished third in the league on defense, allowing 306 goals. They used four different goaltenders that season. Bob Froese, who later played with the Philadelphia Flyers and New York Rangers, played in 52 games that year. He was joined in the Gears net by Ted Tucker, Julian Baretta and Doug Keans. The Gears had a reputation for icing one of the toughest teams in the IHL over the years, and 1979-80 was no different. Don Perry's squad racked up 2184 penalty minutes that year, and had a few notorious tough guys on their roster. Leading the pack was left wing Mel Hewitt, who had 504 penalty minutes in 70 games! Defenseman Jim Branton was next, with 313 minutes in the "sin bin", and fellow defenseman John Gibson had 293 minutes. Three other Gears had over 100 PIM. The Gears opened the Turner Cup Playoffs against the Milwaukee Admirals that season. The series turned ugly quickly, culminating in a brawl late in Game 2 that left Admirals forward Carey Haworth in a pool of blood on the ice, thanks to Gibson. The Admirals protested the Gears' use of "excessive violence" and demanded they be kicked out of the postseason. When the IHL declined to do so, the Admirals forfeited the remainder of the series. Saginaw then ran into the Fort Wayne Komets in Round Two. The Komets would not be intimidated, and made quick work of the Gears, advancing in five games. Kalamazoo would win their second straight Turner Cup, downing Fort Wayne in six games. Programs from 1979-80 are probably the most colorful Gears programs I own. 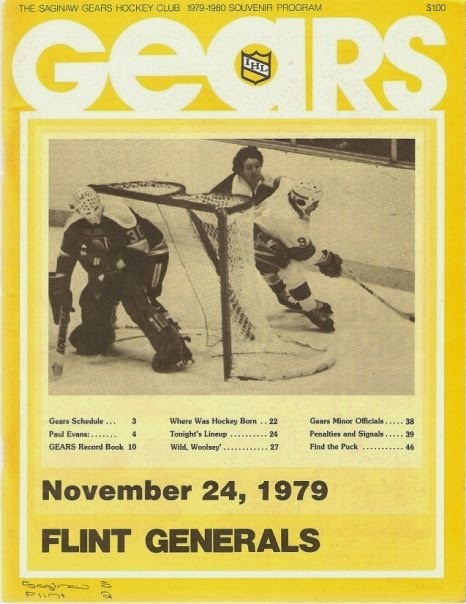 This one is from a November 24, 1979, contest against the Flint Generals. According to the cover, the Gears downed the Generals 5-2, scoring two goals in the third.